Immunogen: Synthetic peptide corresponding to a portion of human α-Glucosidase II. Scientific Background: Alpha-glucosidase II is a 110 kDa glycosylated ER resident protein that is involved in trimming of glucose from newly synthesized glycosylated proteins. Together with an 80 kDa beta subunit, these polypeptides remove two Alpha-1,3-linked glucose from high mannose oligosaccharides linked to asparagine residue on glycoprotein. Alpha-glucosidase II-mediated glucose trimming is necessary for the interaction of clanexin with monoglucosylated substrates such as influenza virus hemagglutinin (HA), MHC Class I, and T-cell antigen receptor (TCR). 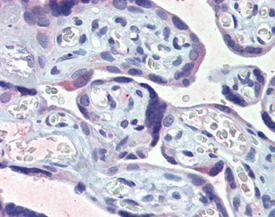 IHC Analysis: Human placenta tissue stained with Glucosidase II α, pAb at 1:100.